Hugely talented singer/songwriter, mum of two and proud Tipperary women who, despite all her success, still finds it hard to take a compliment! – that’s why we love her! Whats your favourite item of clothing? Whats your favourite 80s song? Oh.. well the Christmas number 1 in 1981, the year I was born, was Human League – ‘Dont you want me’ – its a real classic 80s song so I’ll say that! Who did you last compliment and when? Gosh I can’t remember – that sounds really bad doesn’t it?! Im the worst myself; I can’t take a compliment at all! – If someone says something nice, I just say ‘oh this old thing?….. mumble yeah yeah….’ – one of those type of answers! But you know when you walk into a room and it smells really nice as someone is wearing a really nice perfume and I’d say whats that smell? I’d take down the details as I’m big into perfume and I always want to know what the brand is…! God knows! It could be anything! I’ve tried so many things! – Maybe Radio! So if you were a new crayon in the box, what colour would you be and why? Ooh.. crayons always remind me of being a child – my favourite colour combination is pink and purple so I’d find it hard to choose – Id have to go with both – and scribble with them at the same time ! That is so hard! Its impossible to find a song to do all that! But I left school in 1999 and the song Class of ’99: Wear Sunscreen was out and I loved it, with all the advice that was given, and I thought it was really appropriate for us! No one else got to have a special song for the year that they left school so I felt very lucky to be part of a year group that got our own song! Tea definitely – strong tea! Who’s the most famous person’s number in your phone book? Oh I’m not really one of those people who speaks to famous people that much …. can I say the other Saturday girls? A Sandwich and a punnet of fruit! Last TV programme you watched? Derry Girls! Its really funny – I’m catching up on the series at the moment,watching all the episodes in a row! What would you do if you found €5 on the street? And Finally… Finish this sentence…. All I want is…..? 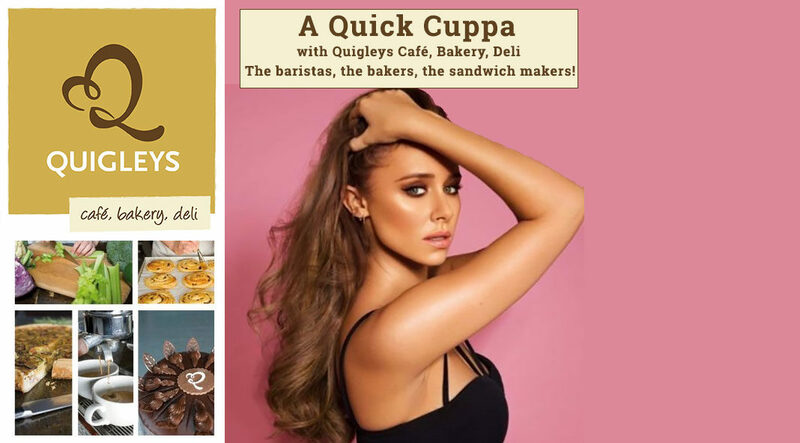 ‘Una Healy Original Collection’ Shoe Range is in over 100 stores across Ireland and on line. 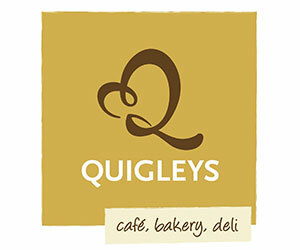 with Quigleys Café, Bakery, Deli – The baristas, the bakers, the sandwich makers!